There are too many pizza parlors…um, I mean nonprofits. In my last blog I promised to prove that pizza parlors are like nonprofits. So here goes. As I was driving home one day I passed the University of Wisconsin-Milwaukee campus. And there, to my amazement, on the east side of the street was a new pizza parlor. I was shocked, stunned and realized that I have to raise my voice about this situation. The fact that it replaced a cheese restaurant wasn’t the cause of my reaction. There are too many pizza parlors and as a concerned community of consumers we have to do something about it. Let me share why I think there are too many pizza parlors. Duplication. This should be obvious. I mean, how many pizza parlors do we need? There is another pizza parlor just across the street that has been there for many years and makes really good pizza. Then there is another pizza parlor on Downer, not a mile away – the rebirth of the venerable Pizza Man. Then, go to North Ave and there are a host of other pizza parlors. If you want pizza, you can get pizza. Did we really need another pizza parlor near UWM? We need diversity of eats, not the same stuff over and over again. This is simply unnecessary duplication. Resources are stretched too thin. This is true in any number of ways. First, I doubt that each of these parlors near UWM had the resources they needed to open, which means they had to ask for loans from banks. How many pizza parlor loans do banks have available? If they keep making these loans to these small pizza parlors, what will happen when the big pizza parlor with the best pizza in the world comes along? There won’t be a loan available anymore because too many small ones have been given out. We also have to realize that the pockets of the hungry students aren't deep. Think back to the days when you were at college. Could you afford to buy enough pizza to keep as many as 4 parlors open? Then there’s the issue of staff. There simply are not enough good pizza makers available to staff all of these pizza parlors adequately. Heck knows that if you have a bad cook, you have bad pizza. And servers. Where are all the servers going to come from? It isn’t fair to the banks that have made the loans to do a bad job with making and serving the pizza. In the end, it means the waste of a good loan. Size and scope. Yes, there are many hungry young people living and studying in the UWM area. But the only way to have a meaningful impact on all that hunger is to have big pizza parlors. Pizza parlors that can make and serve pizza in large numbers and quickly. The small, artisan type pizza parlors take too long to prepare and serve pizzas to have an impact on that hungry horde of students. A pizza parlor that can seat only 8 tables cannot hope to have any real impact. And only the big pizza parlors can afford to track the results of their pizza making, recording how many students have come to buy pizza, and are they returning to buy more pizza? This is a real indicator that the loan the bank made is having a positive impact. If they are eating pizza, their hunger is satisfied. If they come back and eat more pizza, they are not hungry for another day. Chalk up a positive outcome! The small pizza parlors don't track these things. They ask no questions about the customers and so have no information about them that can be used to measure impact. So here is what I propose. Merger. The small pizza parlors should come together to become one large pizza parlor. Then they'll have the size and scope to truly serve a hungry neighborhood around the university. They will be able to spread their resources to reduce the number of cooks and replace them with delivery people who can take the food directly to the hungry students. There can be a restaurant that seats hundreds if not thousands of people. The savings and efficiencies are easy to predict and exciting to think about. We would need to pay for only one oven, instead of several. We can buy tomato sauce and mozzarella cheese in bulk! If any of this sounds familiar, it’s because it is. If any of this sounds foolish, it’s because it is. These are the same foolish arguments that are leveled at the nonprofit sector. There are too many nonprofits, the argument goes. Only large nonprofits can have an impact, so the small ones should merge and become big. There are not enough resources to go around, stretching the donors’ resources too thin. Why is that? Why can we let for-profit organizations try and succeed (or not) but feel we have to control the nonprofit population? At NPC, we've heard on occation that it's our job to make sure there are fewer nonprofits by promoting merger rather then encouraging the creation of new ones. I don't know - I'm not convinced that's our role. I do not want to be the one who said "No" to the great big idea. So, see? Nonprofits are like pizza parlors. Let the market decide. In just seven seasons, Shakespeare in the Park has delivered great outdoor theater to over 18,000 people - many of whom could not otherwise afford the experience. NPC sits down with Executive Director, Susan Scot Fry, for a conversation about why accessibility to theater is so important and how to stay focused on the big picture. Q: Can you give us the history of Optimist Theater? A: Optimist Theater became a nonprofit in 1993, and we incorporated as Midwest Children’s Theater because that was our focus. By 2008, we weren’t doing a lot of children’s theater and decided that we wanted to try Shakespeare in the Park. Our background is outdoor, large-scale entertainment and theater, so it seemed like a natural thing. To kick it off, we thought we should change our name to something else. We wanted to pick a name that reminds us to stay focused and positive about what we're trying to accomplish. That’s how we came up with Optimist. 2008 was also when the recession hit, so we knew we were stepping out on a really ambitious project to get Shakespeare in the Park up and running at the same time. We refer to ourselves more often than not as Shakespeare in the Park, it’s just so much easier. Q: Is Shakespeare in the Park a franchise? Does it happen elsewhere? ​A: It happens all over the country and most of the time it's free to attend. It’s sort of the world view of Shakespeare in the Park companies, including ours. One of the first things I did was check out what the other Shakespeare in the Park companies around the United States were doing and I learned that they’re all free. The giant Shakespeare in Park in New York's Central Park? Free. It’s been going on for fifty something years. Shakespeare in the Park is almost a cultural institution. Most of the time when we say Shakespeare in the Park people know what I mean. It can be rough and tumble and it can be highly polished, or somewhere in between. But a lot of people have a frame of reference that it’s outdoor theater which is one of the reasons we often refer to ourselves as Shakespeare in the Park, because people get it a lot quicker. Makes it so much easier. Q: If it's free to attend Shakespeare in the Park, then how does the production go on? A: Boy, it is not free to produce! We do a lot of grant writing and individual fundraising. It’s mostly the individuals that want to give $20-$100 to help make it happen for everybody else. We do a professional show, meaning we hire union actors, we hire union stage hands, we have professional lighting and costume and sound designers. We go all out and do it. Q: What has your organization done that you're most proud of? A: People from all over the greater Milwaukee area and beyond, from all walks of life, come together for this shared experience. After a performance we have gained a common language - the language of live theater. We've shared an engaging, thought-provoking, enjoyable, engrossing, and sometimes cathartic experience. Q: How has your work in the nonprofit sector inspired you? A: Working in the nonprofit sector inspires me to stay focused on the big picture. Not simply what we do but why. It's a rare gift to have the reason you do what you do be a part of daily life. I don't take that for granted. Q: How have you or your organization been involved with the Nonprofit Center? A: I've attended several skills classes at NPC and, in addition to the opportunity to add to the toolbox, it has been a wonderful crossroads for every discipline imaginable. It's the only place I've been where I get to meet and interact with people working in all nonprofit sectors. We discover commonalities and approaches to challenges that may not be inherently obvious because I'm from an arts organization. We get to realize that we are all part of the same extended family. ​Q: Can you tell us anything about this year’s production? 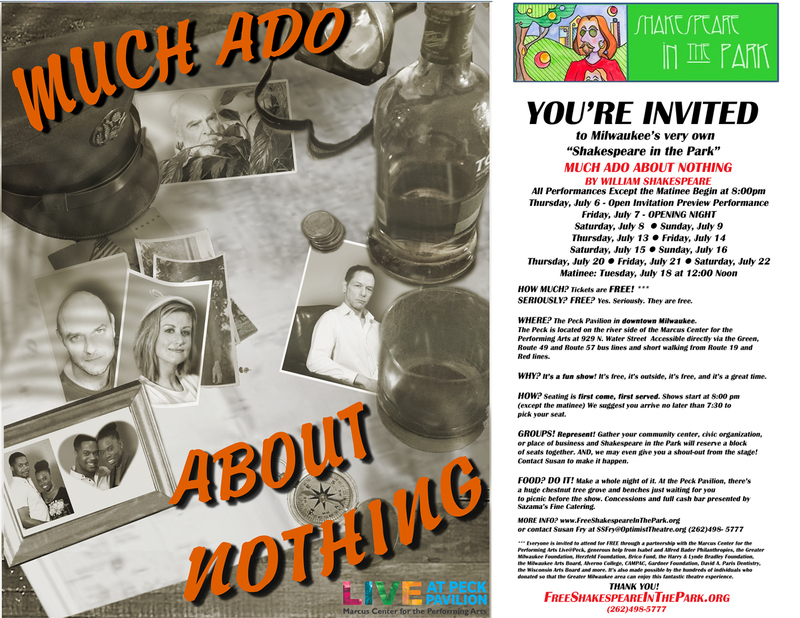 A: We’re doing one of Shakespeare’s most loved comedies, Much Ado About Nothing. It's hysterically funny! Like all Shakespeare, the show has different plots and subplots, but really focuses on two characters - Beatrice and Benedict. They hate each other (but not really). There's word play, there's battle of the wits, they’re so hysterically funny until they’re each tricked into admitting that they’re in love with the other. Q: Do you change anything about the play to make it "modern"? A: It’s Shakespeare’s language - we start with that and don’t modernize it. But we do make the creative concept for the look and feel of the show more accessible. Shakespeare wrote in Elizabethan England, but that doesn’t mean that the plays are Elizabethan. These stories can take place at any time or any place, or even a made up place and time. It doesn’t really matter, as long as it supports the characters of the story. This year, we’re placing it in what looks like a post World War II era island setting, think of a smugglers' island, which is a visually rich and exciting atmosphere. It’s very easy to see where the characters are in the hierarchy and structure of this island, how they know each other and get along with each other, how the relationships evolve. ​"The reason that this show is free is so that EVERYONE can go. It’s one of the best kept secrets in Milwaukee and we want to get it on more people’s radar." Q: What is the most important thing that you want people to know about this year’s show? A: It’s FREE! The reason that this show is free is so that EVERYONE can go. It’s one of the best kept secrets in Milwaukee and we want to get it on more people’s radar.This year we’ve been able to reach out to community groups who weren’t previously aware of the show and we’ve also moved to the Peck Pavilion downtown by the Marcus Center. We have a lot more seating, it’s much more accessible and people can get to it easily. We’d ideally like to connect with people in the nonprofit world. The theater people are already going to come. The arts and culture people are going to come. I want to reach out to the people we are REALLY doing this for, like the school teachers. We’ve connected with Boys and Girls Club, Pearls for Teen Girls, Running Rebels. There’s several organizations that are bringing out large groups this year and we feel it's so important that it’s free. ​All performances except the matinee begin at 8PM, suggested arrival 7:30PM.